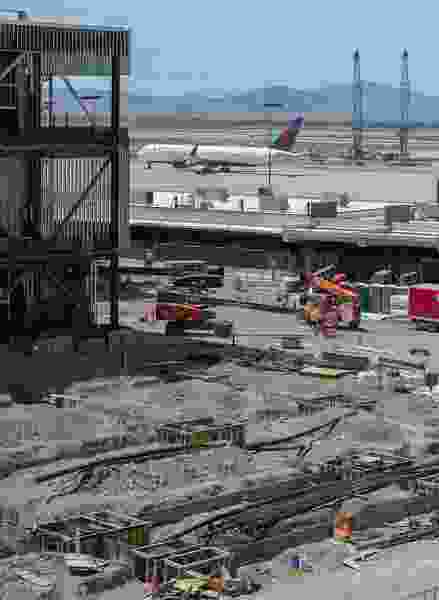 (Francisco Kjolseth | The Salt Lake Tribune) ICE and homeland security agents are said to have been involved in an "enforcement action" at Salt Lake City International Airport as construction continues on Thursday, June 7, 2018. Salt Lake City International Airport has got the punctuality thing down, it seems. It is one of only six U.S. airports — and the busiest among them — to earn a top five-star rating for on-time performance over the past year. The airport saw 86.5 percent of its departures and arrivals occur within 15 minutes of scheduled times, according to the flight-information company OAG for the period of June 2017 to May 2018. The data include canceled flights. OAG issues five-star ratings to the top 10 percent of global airports that have at least 600 takeoffs and/or landings a month. They had to score higher than 85.1 percent this year to receive that rating. Three airports in the weather paradise of Hawaii won five-star ratings: Hilo, 91.4 percent; Lihue, 89.3 percent; and Honolulu, 87.9 percent. Besides Salt Lake City, two other mainland airports earned five stars: Grand Junction, Colo., 87.1 percent, and Boise, Idaho, 85.5 percent. Salt Lake City is the busiest airport among five-star U.S. airports, handling 243,683 operations — takeoffs and landings — a year. Honolulu was second with 156,650. She said all employees deserve some credit — from those who work for the airport to airlines, ground transportation crews, the Federal Aviation Administration and the Transportation Security Administration. “It comes down to the people who work out here, who make sure passengers can get to their gates, on the plane and in the air on time. We all work together very well,” she said. Salt Lake City International is the 25th busiest airport in North America and 85th busiest in the world. More than 330 flights depart there daily to 95 nonstop destinations. It is currently undergoing a $3.6 billion reconstruction project, with the first phase scheduled for completion in 2020. OAG said 44 U.S. airports also earned four-star ratings, “which is quite impressive when compared to the performance of their global peers,” said John Grant, senior analyst with OAG. Among the big airports in the four-star group were Atlanta Hartsfield-Jackson International, 83.1 percent; Houston George Bush Intercontinental, 83 percent; Denver International, 82.7 percent; and Washington Dulles International, 82.1 percent. OAG also issues ratings for airlines. Hawaii Airlines, with 87.4 percent on-time performance, was the only U.S. carrier awarded five stars. U.S. carriers that won four stars were Alaska Airlines, 84.1 percent; Delta Air Lines, 83.8 percent; and United Airlines, 80.7 percent.